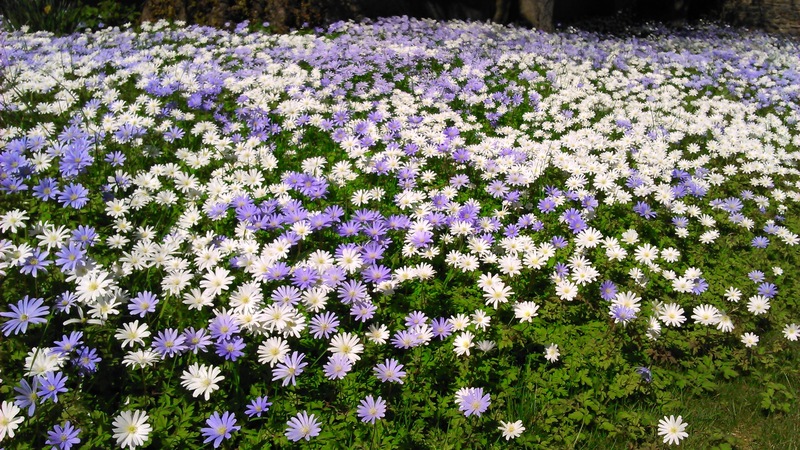 This week I had 2 nominations for the same plant- one of my favourites Anemone blanda- in some ways a humble woodland plant, it works brilliantly as underplanting in pots or more expansively under trees naturalising in a delightful carpet. 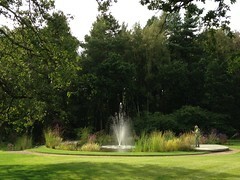 Thanks very much to William Graham and Jean Marshall for sending these photos through-other suggestions very welcome! 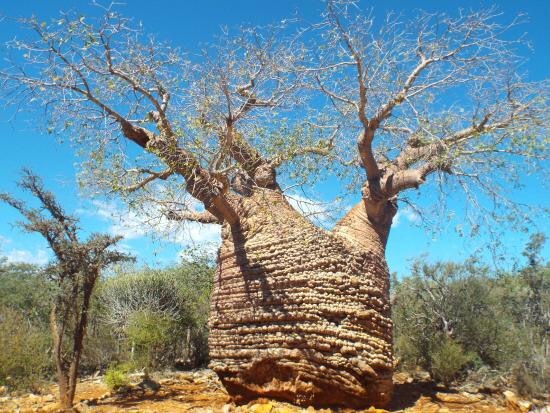 I am away this week so no chance of choosing anything seasonal from my garden, but having been thinking about amazing trees, I have just spent a delightful half hour on Google looking at giant baobabs- not quite sure why, but I highly recommend a little search. 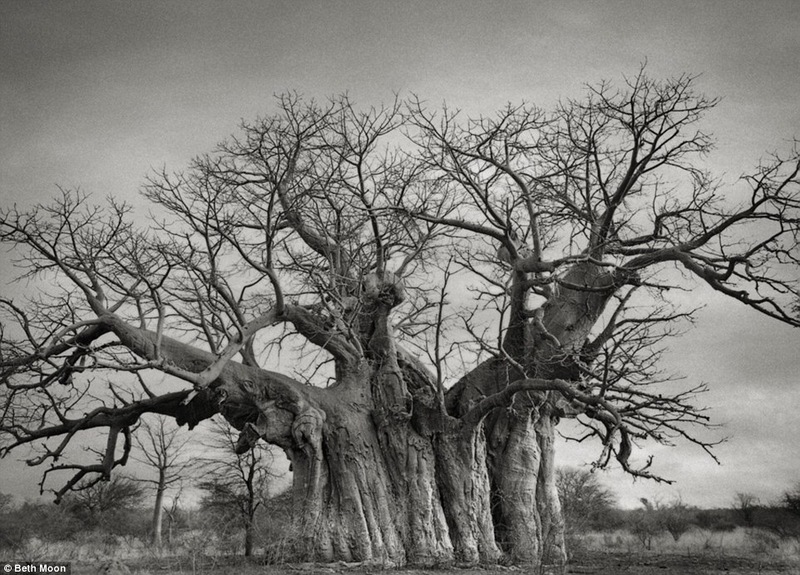 These majestic trees can be enormous, otherworldly in shape, almost unbelievable ancient, and important spiritual hubs (although the largest in South Africa is partially hollow and has a bar inside which is not the sort of spirit I had in mind). 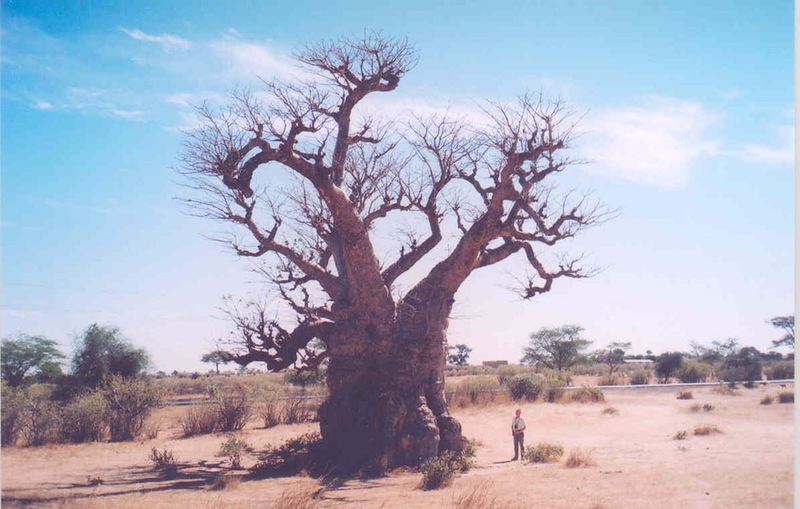 Some are claimed to be 6,000 years old, and carbon dating certainly gives ages of over 1,000. 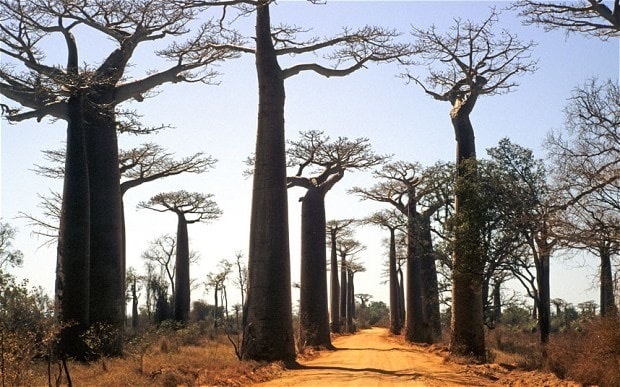 I am not going to attempt to categorise the wonderful range of delights here, but have included some tasters from Senegal, South Africa, and Madagascar. Ok a little slow out of the blocks this time! 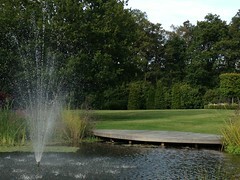 I would like to be a bit more adventurous than simply choosing what is in flower so Clipped Hornbeam Cubes are my choice. The ones below are not yet planted, just laid out ready to go in, but I think you can see the enormous impact they already make on the garden. 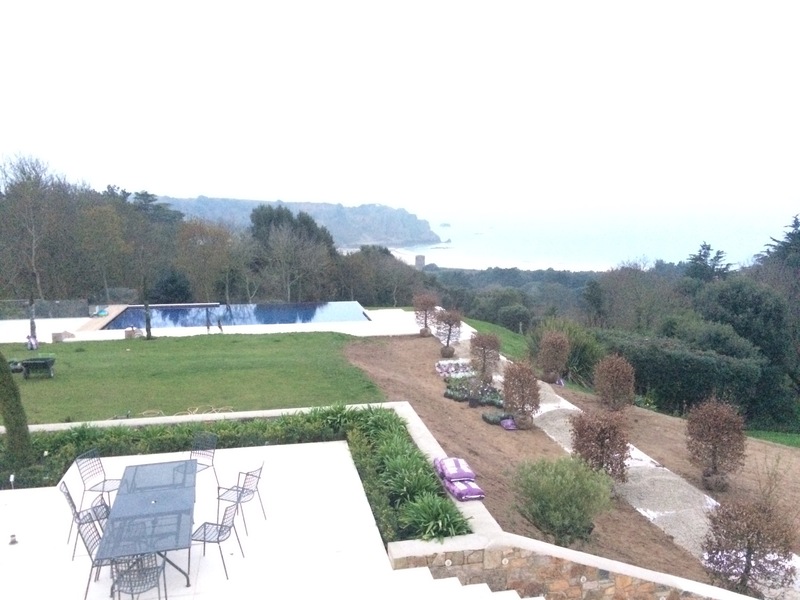 We immediately have an avenue, leading in this case to a fabulous view of the sea (this is a client’s garden in Jersey). 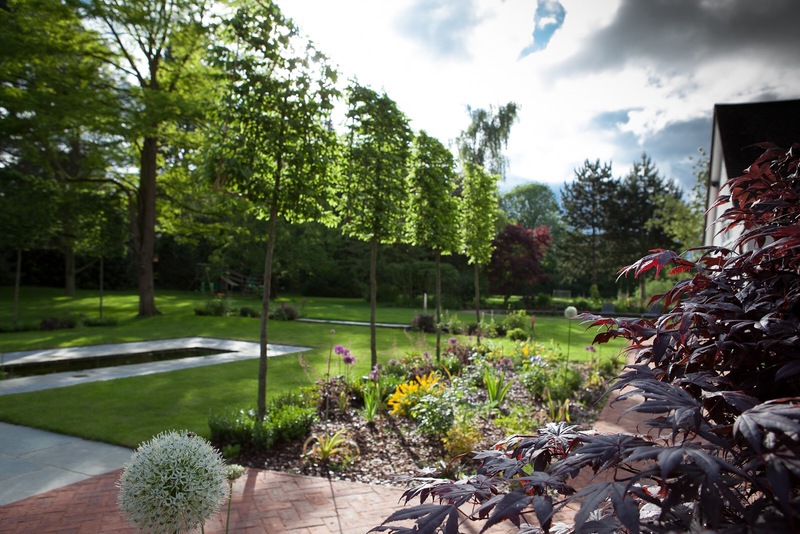 Hornbeam is a very tough and amenable plant, it takes hard clipping- usually a formative prune after planting in winter and for the first couple of years after planting (again in winter) and then maintenance pruning in summer. Hornbeam has a dense twig network and holds on to a fair bit of its leaf in the winter in the brown form making it a good combination for screening without being dark and thuggish in the winter. The ones below have still got a fair bit or leaf despite having just been rolled across the lawn by us! Hornbeam is more commonly used as hedging or espaliers (“hedge on a stick”- see lower 2 images). 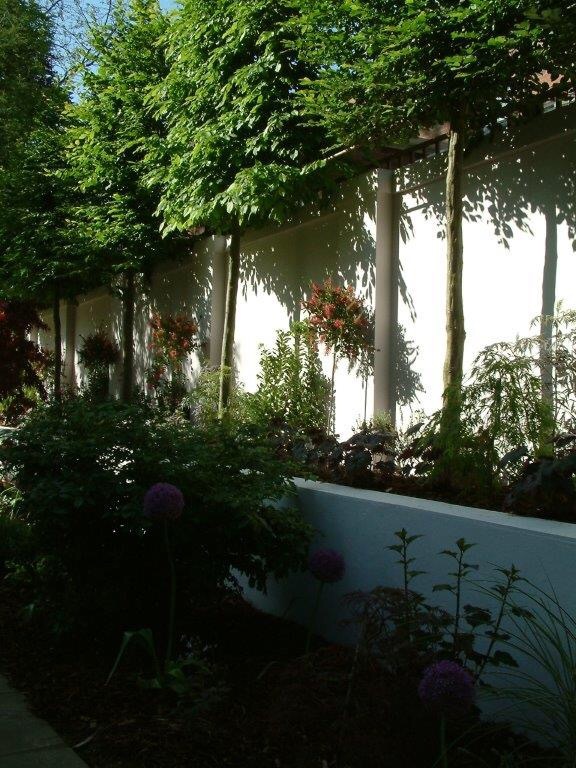 These latter are marvellous for screening above a fence without having to obtain planning permission as well as creating an impact for framing, height and impact within a garden. Hellebore- Helleborus orientalis, or Lenten rose. 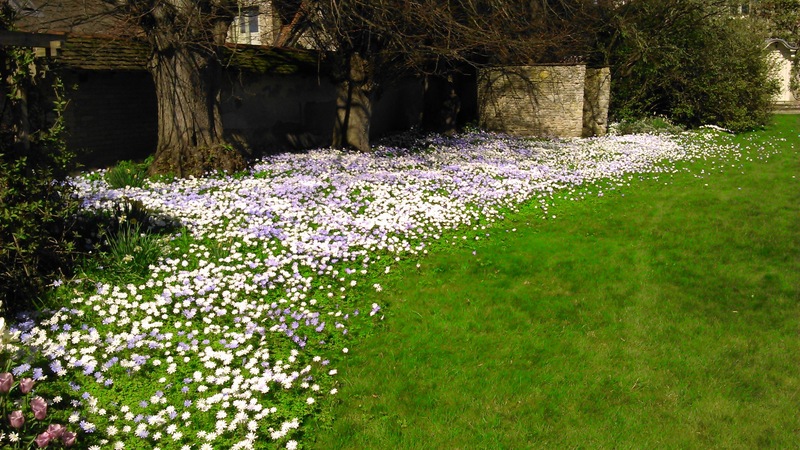 These are a joy in winter, usually flowering in later February or early March. Distinct from the helleborus niger which flowers earlier but is less pretty in form and colours, and foetidus, which is interesting but does smell as it sounds! 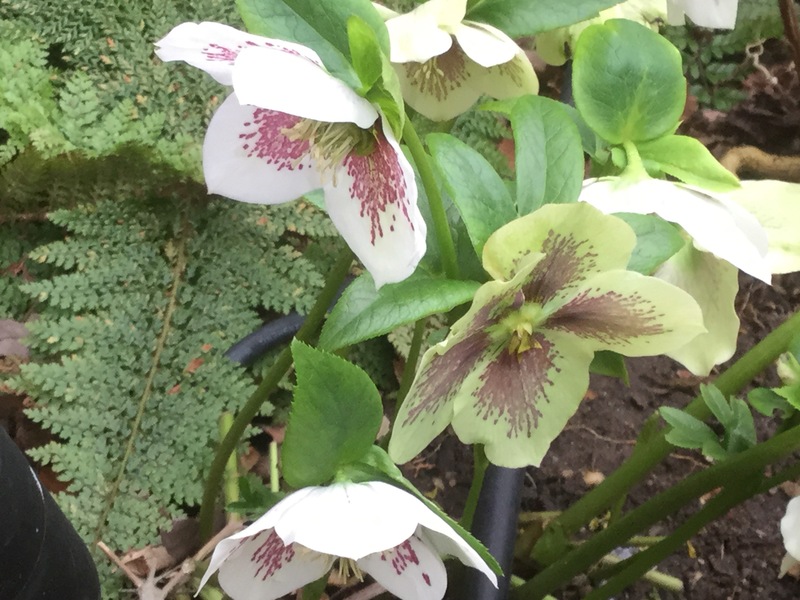 Very easy to grow, hellebores like dappled or even quite deep shade, and prefer the soil to be reasonably well drained and not too dry. In these positions they will naturally hybridise (get some dark purple and some white or pink and see what happens!). 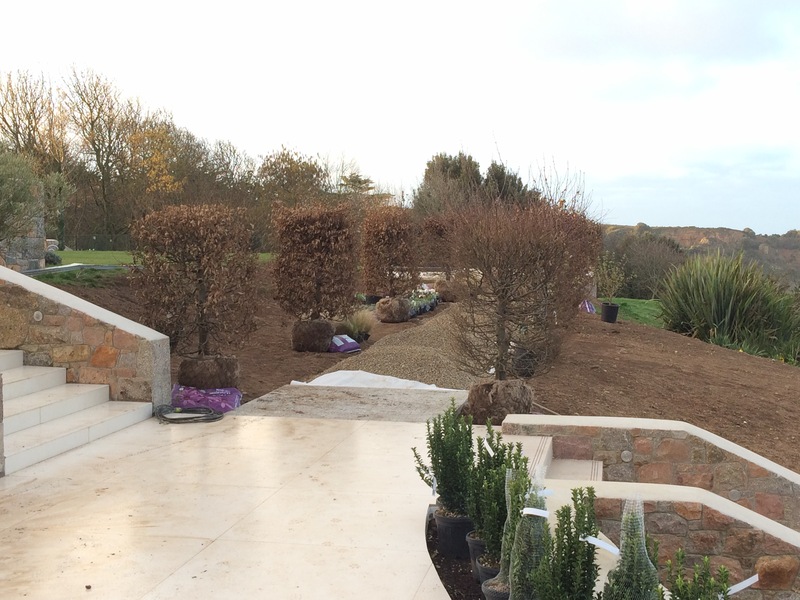 We usually clear the old leaves from beneath the emerging flowers as they can look really messy and detract from the beautiful new flowers. The flowers hang down they they particularly suit planting in raised planters where you can look up into them. Well this cannot really be a surprise, but the snowdrops (Galanthus) continue to look amazing, and I think it would be hard for them not to get a mention. 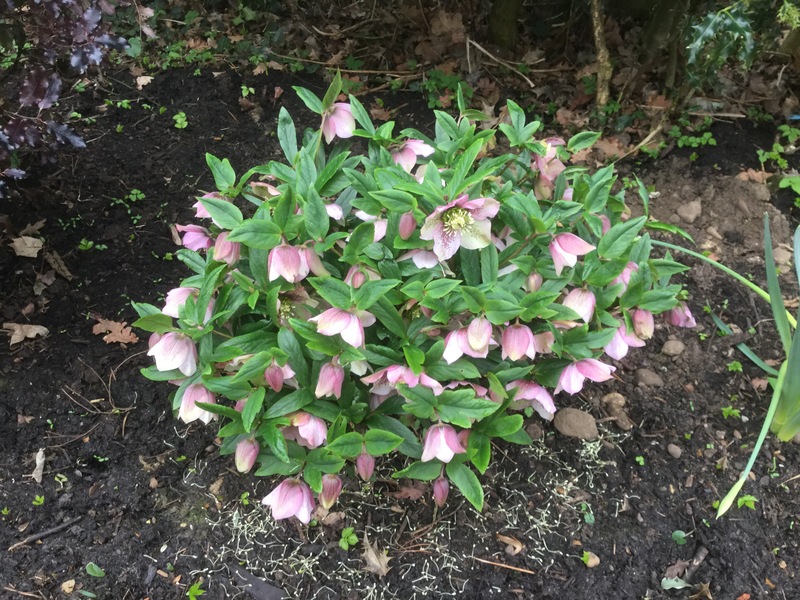 The hellebores are trying hard to take the slot (and may yet do it next week), but planting snowdrops is an incredibly rewarding activity. 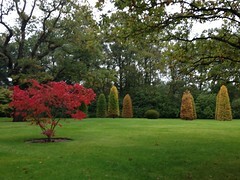 They naturalise pretty fast, and come in a huge range of varieties. 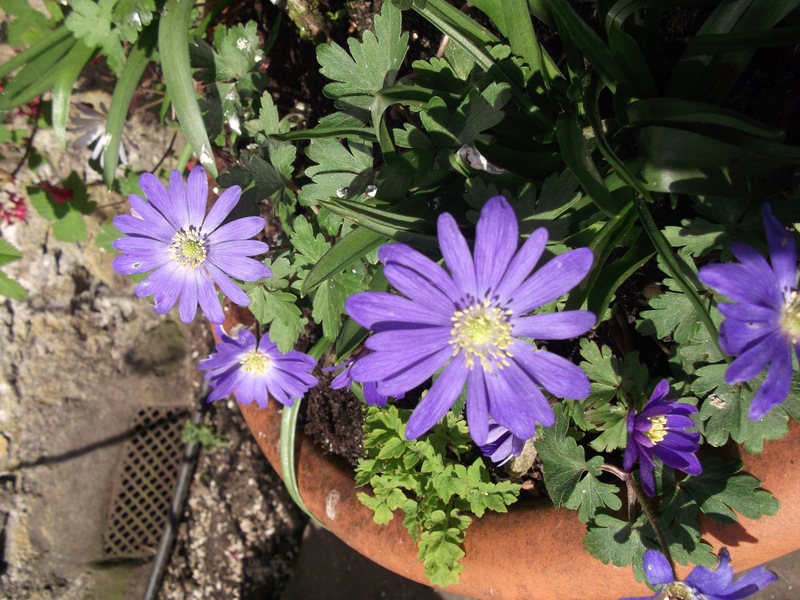 Plant in part shade and moist but well drained soils for best displays. Buy in the green if possible, but bulbs from reputable suppliers usually also do well- don’t stint on the quantities, push the boat out and get 1,000 for a bank or under a hedge. 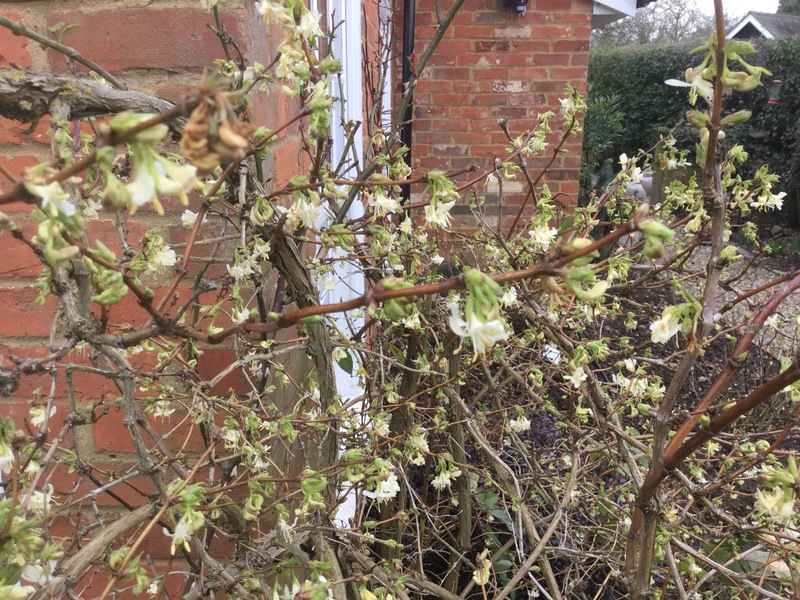 This week I have chosen shrubby winter honeysuckle (Lonicera fragrantissima). 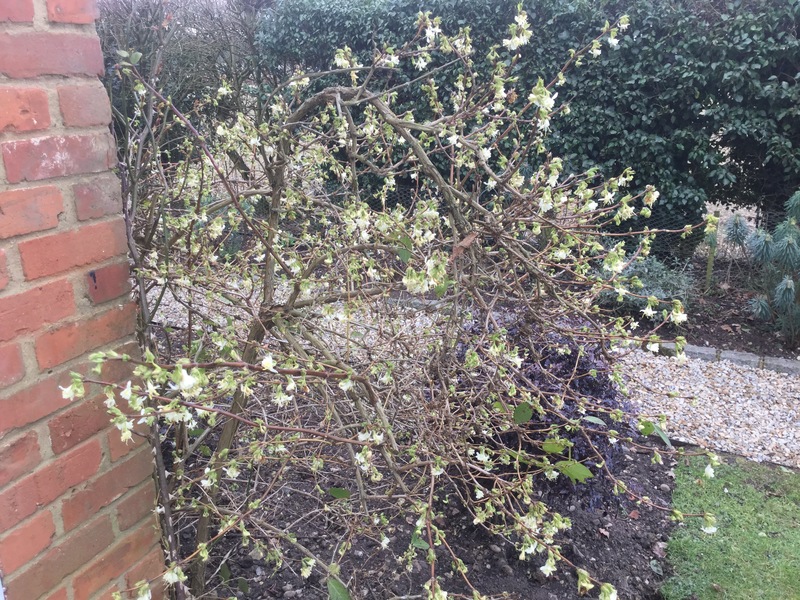 This is a stunning splash of sweetness in February, with bare branches covered with small white scented flowers. Preferring full sun or part shade and moist but well drained soil, I have found them good tempered and plant in quite a bit of shade and in dryer locations (preferably not both) with good results. The one pictured is on a largely shaded north-east corner wall partly under an apple tree. The scent wafts across the garden on a warmer day, and I pick twigs to place in the kitchen and scent the house. 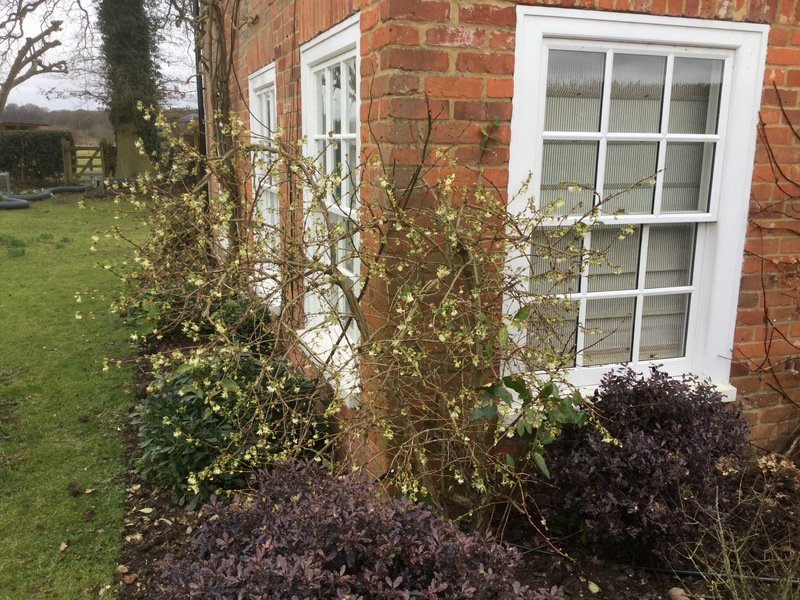 Growing to around 2m they tend to be a bit unruly, and pair well with neater shrubs -as in this example with some loosely clipped purple Pittosporum “Tom Thumb” plants. It’s a good approach to put some evergreen (ever-purple?) 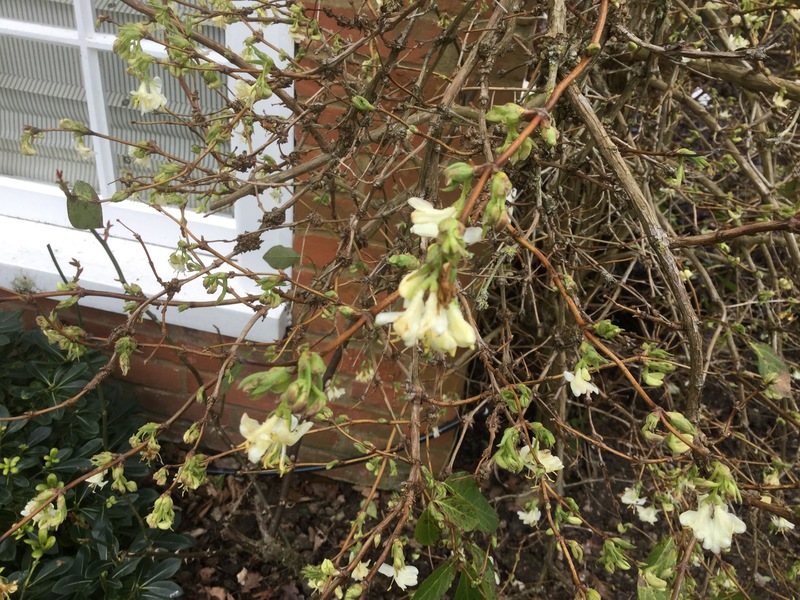 with those like the lonicera that have a short (but delightful) season of interest. It can be clipped to keep it small and therefore can be used in a wide range of mixed borders with other shrubs and perennials. There are berries to come which the birds like but which are dull red in colour, and the leaf is a smallish plain green oval- attractive as a light backdrop. We thought we would see if we can choose a plant for every week of the year this year- based in plants seen by us personally so no cheating! 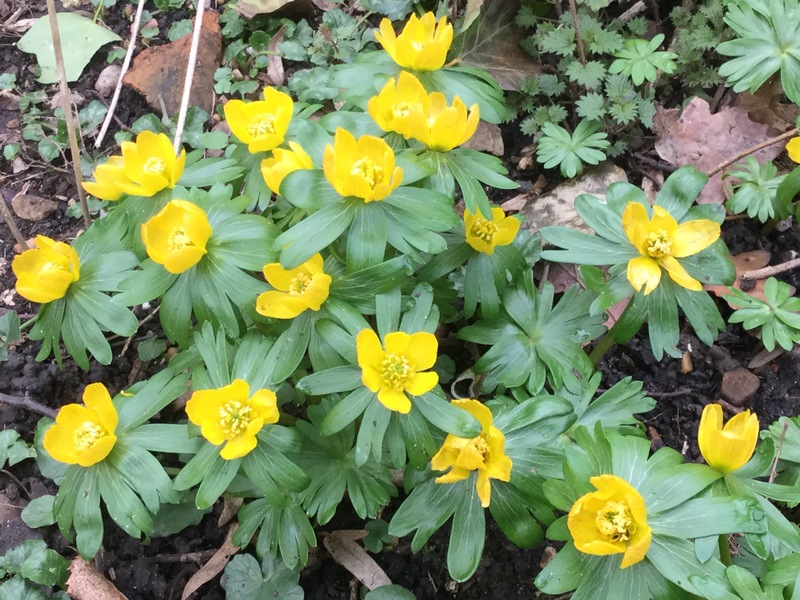 There are a surprising number of options to choose from in the burgeoning Spring-like weather, but this week I am choosing Winter Aconite (Eranthis hyemalis). These are tuberous perennials for sun or part shade- propagate from seed or divide tubers after flowering and you will soon have a delightful later winter/early spring show. 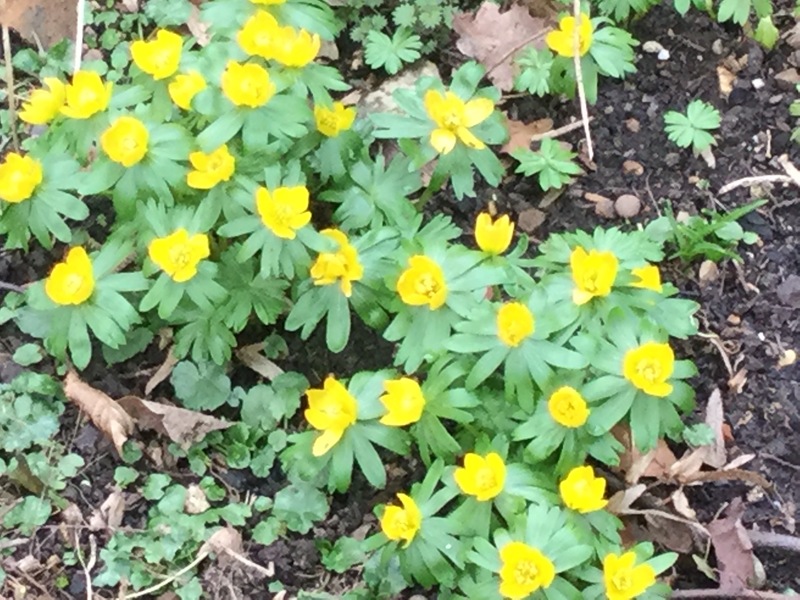 They are not usually cheap and take a little while to get going, but very satisfying at this time of year, and seem to be left alone by the rabbits and other pests that usually attack my garden. Fine in pretty much any soil- they apparently prefer it alkaline (which is what these are in). 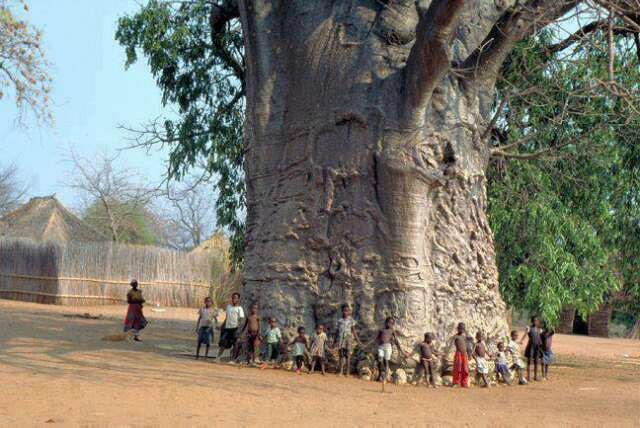 Look out for them “in the green” (i.e. 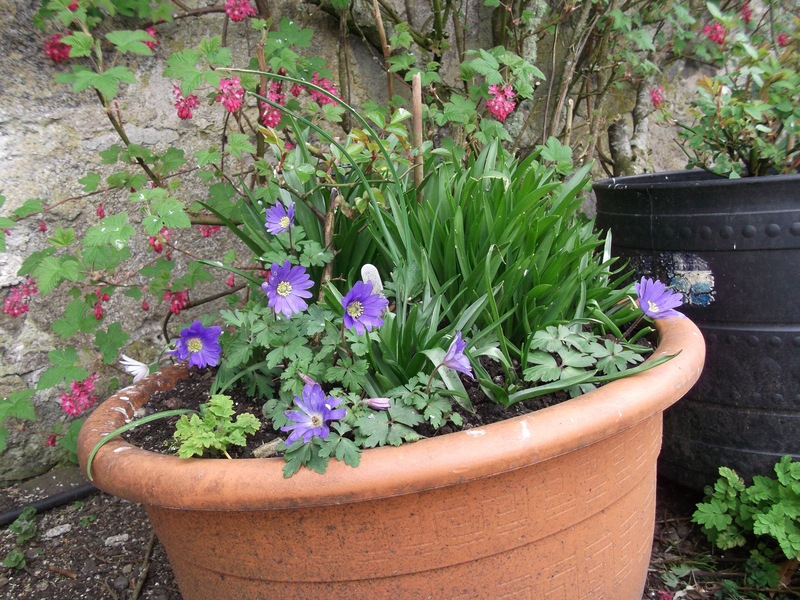 in pots or bags) after flowering as this is a good way to get them going. Suggestions for next week most welcome!